an arpeggiator is often a built in device in synthesizers, it will listen to the keys you play (chords). when you play a chord it will play (depending on the settings "up" ,"down" , "up/down") each of the played note beginning with the lowest one, after that it will play the next.. if it is set to down ot will of course play the highest note first. if it is in random mode (thats something old Roland ARP'ers offer) ANY of the held notes will be played! so it is "random" but it will of course only play one of those you played as a chord! 1) and 2) are no longer available new since waldorf and oberheim do no longer exist (waldorf came back in 2007, but not with a new Arper). (well if you count viscount in as "oberheim" they do.. but it's more the paper not tom oberheims company!). the gecko was a very small device to be controlled by midi with one knob to set all parameters..
3) is about 90€ and is still being made by MAM germany. 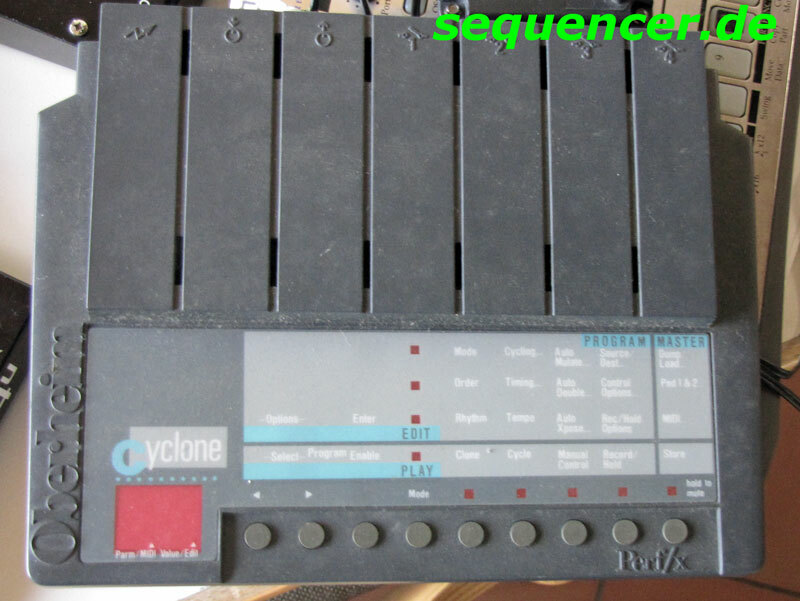 it'S quite like the cyclone..
the coolest Arpeggiators also have "TR-like" step programming like the Korg microkorg or complex pattern settings like the Waldorf Q had (you could set glides, random notes, step shifting etc.. and save it with the patch). the normal "standard" arpeggiator today offers poly arp'ing with some user patterns that sometimes remind of little step sequencers, others are more basic, like one of the first Arp'ers ever (Roland Jupiter 4) and Roland System 100 Keyboard named 184 had the same Arpeggiator inside 1978/79. So the Jupiter 4 and System 100m Keyboard 184 appear to be the first synthesizers with arpeggiators. but they all have these parameters: up / down , alternating (up/down), sometimes random and octave settings: this means: the chord will be played again but one octave higher! so a setting of 3 with one note pressed and "up" mode will play the "assimilate" them by skinny puppy ;) (hope you know it..)..
later ones will also accept the VELOCITY that you played!! .. this makes a lot of "groove" especially if you can skip and set the "steps" like on the microkorg and the jupiter 6 "europa" expansion..
older ARPers got a trigger in jack , a trigger will play the next note, you could trigger it by some ind. out of a drum machine or like that.. so you can have more control over the rhythmic pattern.. a TR808 or electribe will do it fine.. newer ARPers will have MIDI clocked triggering.. if it is a cool thing, it can still be triggered externally by any audio signal..
etc, / to be continued..
Diese Seite wurde zuletzt am 21. Juni 2012 um 22:06 Uhr bearbeitet.